He began studying Go Ju Ryu in 1974 with Hanshi Ralph Vergalitto. 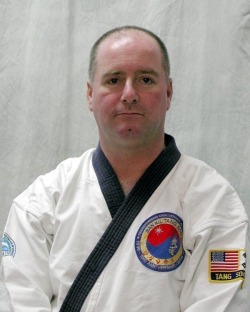 In 1978 he began studying Tae Kwon Do Moo Duk Kwan with Mr. Michael Enright; and Tang Soo Do Moo Duk Kwan with Kwan Jang Nim Charles Ferraro and Instructor Roger PetroRoy. Kwan Jang Nim HC Hwang was one of his mentors. He currently is a student of Kwan Jang Nim Song Ki Kim (#312), Grandmaster of the World Dang Soo Do Union. "He models the humility of Tang Soo Do and produced many of the first generation Korean Instructors here in the USA", quotes Kwan Jang Nim Sgro.